Recently, I received a surprise package of 1966 and 1970 cards from the folks at DeansCards.com. Thanks, Dean! Over the past few years, I have purchased many vintage cards from them (usually 'Ex', sometimes 'VG'), and have always been satisfied with the quality of their cards. This is the first of several 1966 cards from that recent package. Back in the late 1960s, I was somewhat of an Orioles fan (one needs to have an AL team!) Even though I'm not a Brooks Robinson fan, I always like getting his cards (and now have his '66, '68, '69, '70, and '72 cards). I think it's because I was never able to get his 1967 card. Oh well, the '69 card photo is similar to the '67. 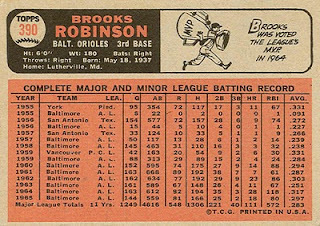 Brooks Robinson was signed by the Orioles in 1955, and made his major-league debut in September call-up that season. 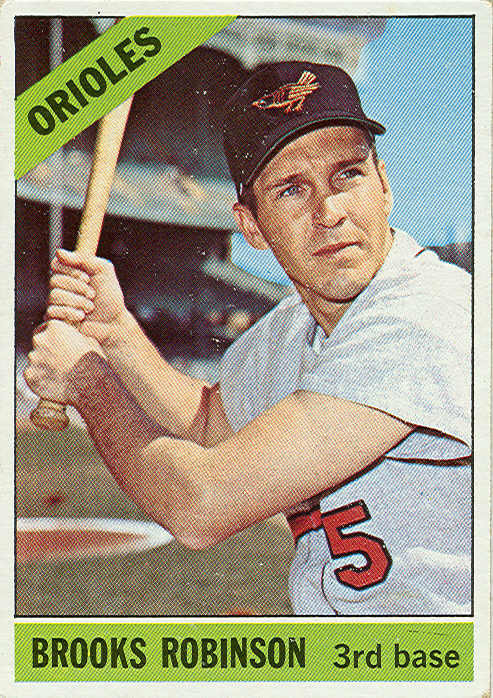 Robby spent all of 1956, and part of 1957 in the minors, but became the O's full-time 3rd baseman in 1958. He committed 21 errors in 1958, the most of any year in his career. After spending part of 1959 in the minors, he re-established himself in Baltimore in 1960. He won a gold glove at 3rd base every year from 1960 to 1975, and was an all-star selection every year from 1960 to 1974! He also led the league in games played in '61, '62, '63, '64, and '68, and was the American League MVP in 1964. 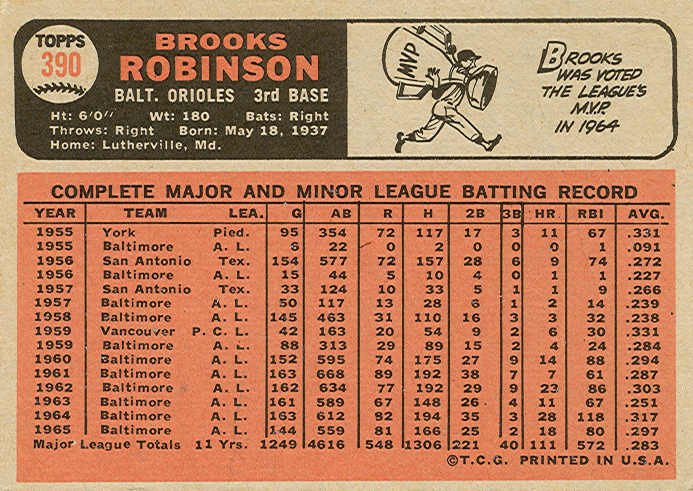 The Orioles' exploits in 1966 and the early 1970s are well-documented, and Brooks was a big part of those teams. Robinson played 23 seasons in the majors, all with the Orioles. 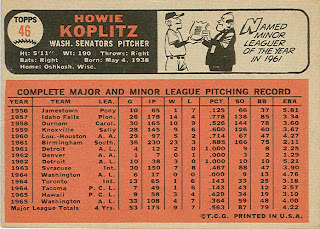 My 1966 blog resumes with the final card of Senators' pitcher Howie Koplitz (#46). Howie was signed by the Tigers in 1956, and pitched for 6 years (mostly as a starter) before making his major-league debut in September 1961, after compiling a 23-3 record that season at double-A Birmingham. In 1962, Koplitz appeared in 10 games for the Tigers, compiling a 3-0 record in 6 starts. This wasn't enough to earn a permanent spot on the team, as he spent the entire 1963 season back in the minors. 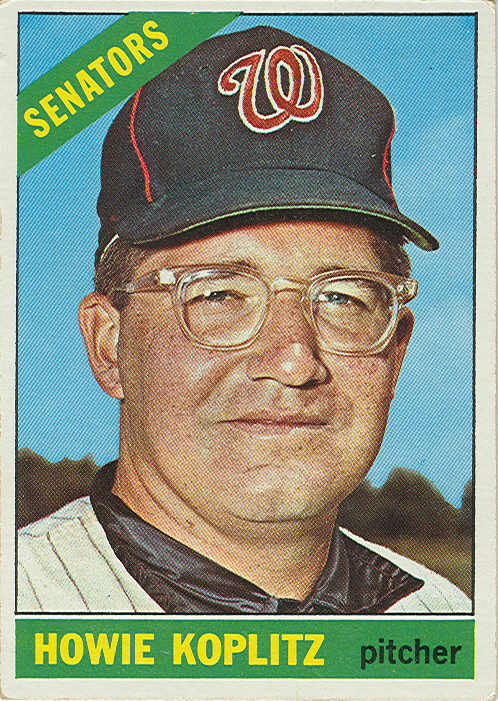 After the 1963 season, Howie was selected by the Senators in the Rule 5 draft. However, he spent most of the 1964 season in the minors, so I assume the Tigers declined to take him back, allowing the Senators to demote him. 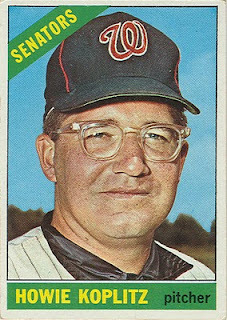 In 1965, Koplitz pitched 9 games for triple-A Hawaii, but returned to the majors with the Senators for 33 games, his longest stretch of big-league service. 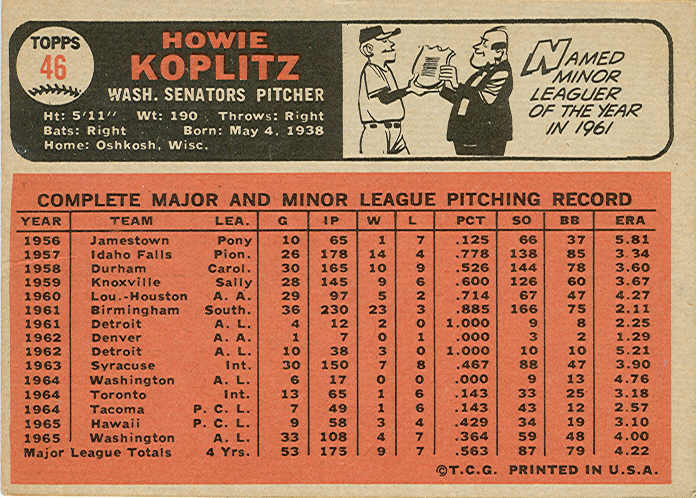 Howie's last pro season was 1966. He pitched 1 game for Washington and 3 games for their double-A York club before a shoulder injury ended his career.